Now you can meet new people while driving to and from your destinations and make an extra buck on the way! 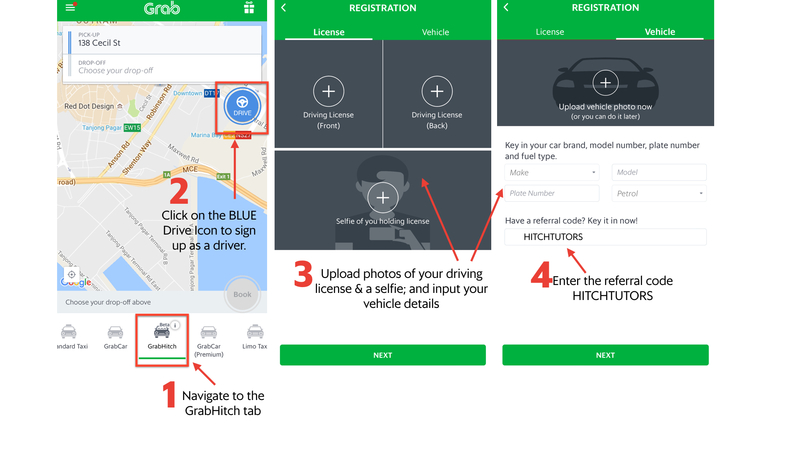 GrabHitch is NOT a taxi service, you are not a driver nor a chauffeur, you are essentially Hitch-hiking with someone who is going along the same way. Whether you’re a driver with seats to spare, or a passenger who needs a hitch, GrabHitch helps the both of you to share costs and a ride. Even better, you get to make extra money that covers some of your petrol costs without detouring too much! You MUST enter your referral code HITCHTUTORS to get your $30 credit after you completed your first GrabHitch ride as a GrabHitch driver. For existing GrabHitch drivers, thank you for continuously showing your support for our social ride sharing platform. Share the love and spread the joy this November and get $20 for every additional driver you refer to GrabHitch! This incentive is only eligible for new drivers who sign up and successfully complete 1 Hitch ride as a driver between 10th November 2016 @ 00:00 hours – 31st December 2016 @ 12:00 hours. New drivers must sign up with the referral code HITCHTUTORS in order to qualify for the $30 credit incentive. The processing of the $30 credit incentive will only be conducted after the incentive period has ended (post-31st December 2016). If you’re still not sure how to sign up, or have any questions regarding GrabHitch, email us at grabhitch@grab.com with the Subject: HITCHTUTORS and we will get back to you in 1-3 working days.